Zante is the Italian name for Zakynthos, the third largest island in the Ionian Sea. Arguably Zante has some of the most beautiful coastline in all of the Ionian islands. With bright turquoise waters, sweeping white cliffs worn through with caves and arches and pristine white sandy beaches. Anywhere this beautiful, with beaches this postcard perfect, is going to be popular and the southeastern coastlines have some large hotels and resorts well known by the package holiday companies. But there’s plenty of peaceful stretches of coast and small, Ionian style villages as you head north. That’s where you’ll find our Guru’s recommendations for the best places to stay on Zante. The western and northern coasts are quite mountainous and there are some amazingly dramatic cliffs which drop hundreds of feet straight into the sea. So while these aren’t the best places to hunt for beach paradise, they’re fantastic when seen from the extremely clear sea below them, or from the clifftops. It’s well worth hiring a car, even though the roads are quite winding and occasionally frightening. Zante’s popularity means that there’s all sorts of activities on offer here, all your standard land and watersports and then the slightly more exotic ones like quad biking and zip lining. As soon as you leave the coast things get quieter though, the forests and mountains of the interior are a great place to come to hike or bike. Hardly any visitors explore the interior but it’s extremely lush and between March and May just littered with wildflowers. Before the earthquake of 1953, Zante had some exquisite Venetian architecture, which is now mostly ruined, but there’s still something of Venice’s main square in the pretty piazza of Zakynthos Town. Busy and bougainvillea decorated, Zakynthos Town is the island’s capital and has a ferry port and harbour lined with cafes, bars and restaurants. Agios Nikolaos in the northeast is a tiny town but the second largest port, where the ferry to Kefalonia departs. This is also where you leave when visiting the Blue Caves - which are certainly one of the island’s highlights. Laganas is the party town, with a main street populated almost entirely with bars and nightclubs. Tsilivi is a good choice for families and Vassilikos is a much quieter village with no hotels just villa accommodation. Unwind on the pristine white sand beaches and swim in the crystal clear waters. Hike or cycle through the epic, rugged landscape. Make a stop at the excellent Solomos museum. Hire a boat and explore the impressive Blue Caves. Don't forget that this is a very busy island during the peak summer months. So if you want to book one of the best places to stay in Zante during July or August, you'll need to get organised and plan well ahead. 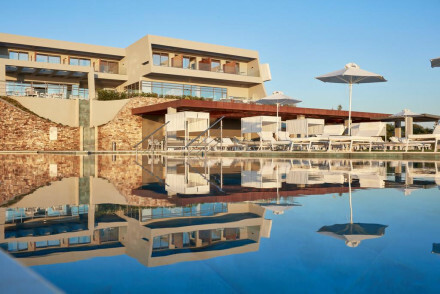 The Porto Zante Villas & Spa are a collection of luxurious villas right on the coast. There are just ten villas. Each with a private pool, marble bathroom and wonderful private terrace facing the ocean. There’s a fabulous waterfront spa, chic cocktail bar and a Mediterranean restaurant. If you're travelling with family or a group of friends it may be a better option to book a villa or apartment. For a wide range of properties for all tastes and budgets we recommend you visit our online partner Booking.com. Zante is served by one airport located towards the south end of the island caters to both international and domestic flights. Travel in between the months of April - September for warm days. The months of June - August can get very hot so best avoided for some. If you plan to hire a car, we recommend you visit our online partner Rentalcars. 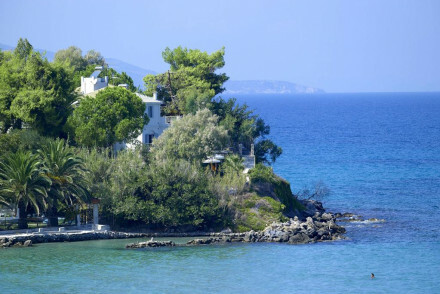 Expand your search to include all the best places to stay on the Ionian Islands. Or the best places to stay on Ithaca? A secluded hilltop property offering glorious sea views. Suites and rooms are all white on white with plenty of glass, all the mod-cons and indulgent bathrooms. Expect a selection of bars and restaurants, a fabulous spa and glorious pool. Ideal for romantic getaways. Hideaway - A luxurious clifftop property offering an exclusive escape. Sailing - Take a private cruise around the island. Luxurious villas with exotic views of the ocean. Rooms come with private pools, marble bathrooms, lavish toiletries and sea facing private terraces. A Mediterranean restaurant, a chic cocktail bar, a fabulous waterfront spa and other 24 hrs five star services. Winner of several awards. Lying on a charming peninsula, these picturesque villas overlook the Ionian sea. The rooms are light and fresh, with whitewashed walls, linen curtains and tiled floors. The villas feature multi-functional living quarters leading onto outdoor terraces, with loungers and hammocks. A magical spot.